Amphetamines (uppers, bennies, pep pills) are artificial stimulants. They are closely related to dextroamphetamines (dexies), methamphetamines (speed, crystal, meth, crank), and smokable methamphetamine (ice). They all have similar effects. Even experienced users may be unable to tell which drug they have taken. These drugs come in tablets and capsules that can be taken orally. They can also appear as off-white crystals, chunks and powders, which may be sniffed or injected. Smokable methamphetamine looks like shaved glass slivers or clear rock salt. Amphetamines may be prescribed for controlling Parkinson’s disease, narcolepsy (attacks of uncontrollable sleepiness) and hyperactivity. They are no longer used medically to treat depression and obesity because of their dangerous side effects. 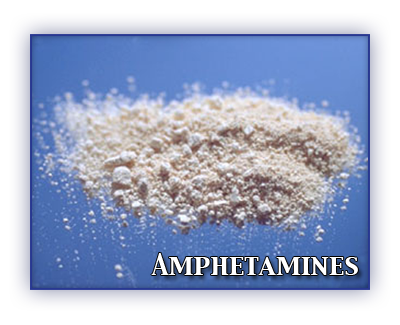 Because amphetamines increase alertness, energy, and a sense of well-being, they are sometimes used illicitly by truck drivers, shift workers, students, athletes and body builders. But possessing, manufacturing, trafficking, and prescription shopping for amphetamines can result in fines, prison sentences and criminal records. Some methamphetamine users repeatedly take the drug over several days in order to maintain the euphoria. These binges or “runs” often continue even when agitation and frightening hallucinations replace the feelings of exhilaration. Some users experience feelings of power and superiority. Some become hostile and aggressive. Use with alcohol and other drugs is especially dangerous. Most of these problems disappear a few days or weeks after drug use stops. Amphetamine users who inject the drug with shared needles risk getting hepatitis and AIDS. Injected particles, which do not dissolve in water, damage blood vessels, kidneys, lungs, and brain tissue. If you use drugs often, you can develop serious personal problems. Using drugs can become more important than family and friends. You may continue using even when your job or schoolwork is suffering, or when you run into financial, spiritual or legal problems. Young people who frequently abuse drugs may not learn how to solve problems, handle their emotions and become mature, responsible adults. Babies born to amphetamine users are more likely to be born prematurely, have low birth weight, and experience withdrawal symptoms like agitation and drowsiness. They may also have an increased risk of birth defects. The drug passes to nursing babies through the mothers’ milk. Regular amphetamine users develop tolerance. As their body adapts to the drug, they need larger doses to feel the same effects. After chronic use, even at low doses, users can develop dependence. Cravings can get very intense, and users may go to great lengths to obtain more. They continue to use the drug to avoid the crash they experience when the drug’s effects wear off. Withdrawal from amphetamine use can result in extreme tiredness, disturbed sleep, anxiety, hunger, depression, and suicidal thoughts.